You’ve seen all kinds of church signs — funny, cringy, cliche, and provocative — but have you ever seen one that got a guy fired? That’s what happened in Weed, California. Not a joke, that’s really the name, he’s from Weed. Population — about 3000 or so. You’d expect people from a place called ‘Weed’ — in a State where pot is now legal — might be more laid back about things. They’re not. The guy who put up an ‘offensive’ Church sign is now out looking for work. LGBT groups protested the church; someone trashed the sign, stole some letters and broke the power box. 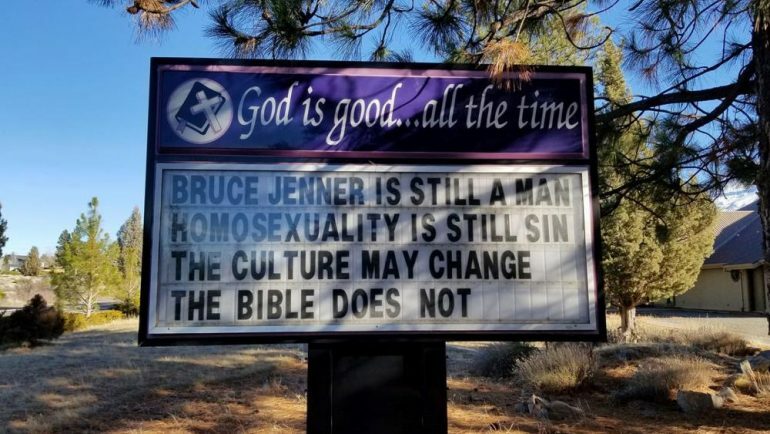 Shortly after that, the pastor put the same message up again. Which of these statements do you think got them riled up? Saying Jenner is still a man is ‘offensive’? Is it? Sure it hurts the feelings of some activists, but supposing Jenner’s DNA (for whatever imaginary reason) was discovered at a crime scene, — would the testing send the forensic team looking for a male or a female? What about homosexuality still being a sin? Are we still outraged when we read news stories about men in clerical collars busted doing drugs and bumping uglies or not? Is it because we find it merely ‘distasteful’ or because that constitutes a MORAL failing on the part of the clergy? We used to call moral failings by a really ‘judge-y’ three letter word. Anyone recall what that is? Oh right. ‘Sin’. But we’re not supposed to say that word anymore… not in our PC ‘Emporer has no clothes’ kingdom where ‘everything goes’ — except traditional belief, you monsters! Isn’t that the real objection? Cultural Marxists don’t merely want us to accept that others live among us with ethical systems that run contrary to ours. (They want that, but not JUST that.) They expect everyone else — in the name of ‘tolerance’ to reconfigure THEIR ethical systems to accept and normalize theirs. Some ‘Churches’ have already bowed the knee to this, and culture is further emboldened. Other pastors are afraid to speak clearly what they believe. But the Son of God didn’t come to give us simply ‘affirming’ words, did he? His words — though they brought healing — were often deeply offensive. He told one chick ‘bring your husband’. She said she ‘didn’t have one;. He told her, ‘that’s true’. That she was on her fifth, and the guy she’s got now is just a shack-up. She called him a Prophet from that moment forward. Preachers today would wonder whether they should even call her ‘lifestyle’ a ‘sin’… or whether they should give some tired old ‘God understands our weaknesses’ line. A Church can’t faithfully proclaim Jesus’s oft-repeated message of ‘Go and Sin no More’ if you pretend there’s no such thing as sin. 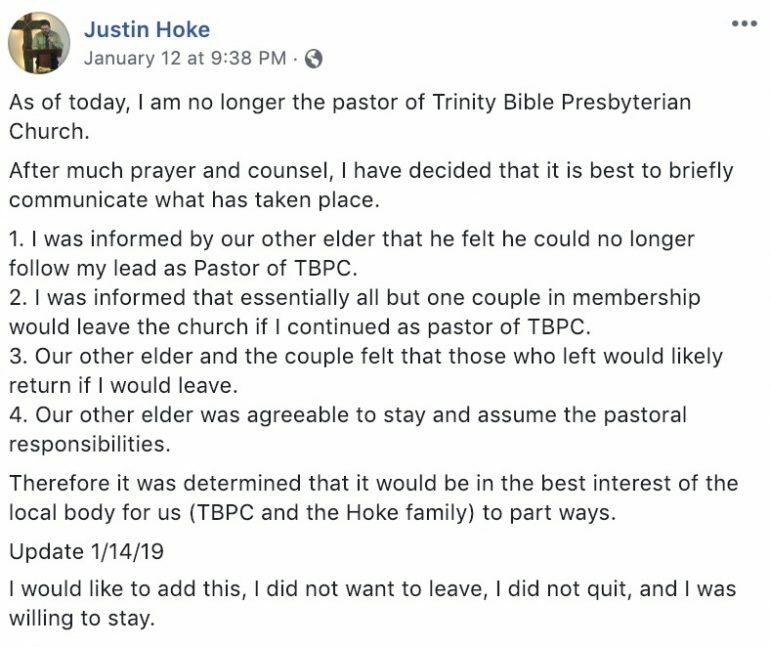 Now, there is one question that IS fair to ask is whether the pastor was being ‘provocative’ or if he was just being an a$$hole. After all, the same Jesus who was often offensive also said ‘be as wise as serpents and as harmless as doves’. 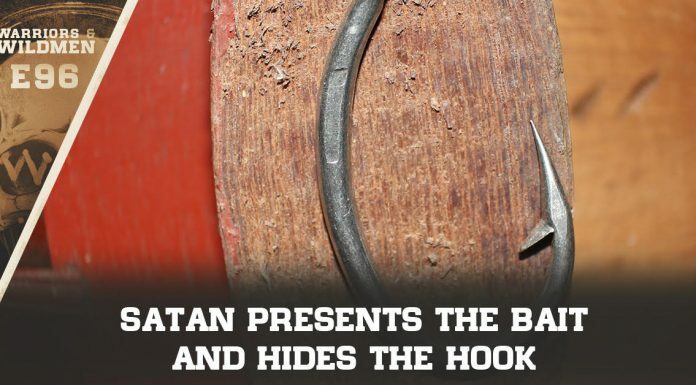 Not everyone who gets ‘persecuted’ is actually ‘persecuted’ for the gospel’s sake. Some people get kicked around a lot in life do so simply because they make dumb choices, or, even worse are generally a dumbass. At least this guy took the high road when he left. He left quietly to keep the Church from fracturing. There was no animosity. There was no sulking, and no asking for handouts. “Many people have reached out asking if they could help me in some physical or monetary way. I am really thankful for such thoughts and offers. But, I don’t want to use this 5 minutes of fame as a chance to capitalize on the sympathy and good will of others. The Lord has taken care of my needs,” he wrote in a Facebook post. Where did things go sideways for this guy? ... he said uncomfortable truths.